Some interestig tidbits about domains today. A domain name registrar is an organization or commercial entity, accredited by the Internet Corporation for Assigned Names and Numbers (ICANN) or by a national country code top-level domain (ccTLD) authority, to manage the reservation of Internet domain names in accordance with the guidelines of the designated domain name registries and offer such services to the public. Also of interest: Independent Domain Registrars. They are basically independent entities that functions as both registry and registrar, but for particular second level names assigned to them (for example, “uk.com”, “au.com”, “hk.com”). In the Dot-com days, a well known phenomenon is Cybersquatting. (i'm a dot-com-er, 1998 to 2002.) Today, the purchasing domains for actual use or for reselling, have become mostly legitimate, and the term cybersquatting mostly refer to those domain name buyers with devious intentions of resell at high prices. Also of interest: Drop registrar. A drop registrar is a domain name registrar who registers expiring Internet domain names immediately after they expire and are deleted by the domain name registry. A drop registrar will typically use automated software to send up to 250 simultaneous domain name registration requests in an attempt to register the domain name first. Also interesting: Domain tasting. Basically, domain names registration has a 5-day grace period. If buyer doesn't want it within 5 days, he doesn't have to pay. (the free grace period problem has been fixed since 2009-04.) So, the abusers using automated software to buy hundreds or thousands domain names, and test them out for few days to see which actually generate traffic (from user's typos, etc). 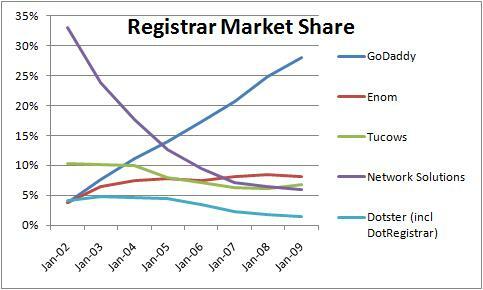 In April 2006, out of 35 million registrations, only a little more than 2 million were permanent or actually purchased. By February 2007, the CEO of Go Daddy reported that of 55.1 million domain names registered, 51.5 million were canceled and refunded just before the 5 day grace period expired and only 3.6 million domain names were actually kept. In January 2008, Network Solutions was publicly accused of this practice when the company began reserving all domain names searched on their website for five days., a practice known as Domain name front running. The secondary market for domain names covers previously registered domain names that have not been renewed by registrants or are available for resale. Sometimes these dropped domain names can be more valuable due to their having had high-profile websites associated with them. They will have links from other websites and could still have users searching for the websites because of these links. Others can be valuable because of the generic nature of the domain name or the length of the domain name, with two and three character names being the most sought after. The business of registering the domain names as they are deleted by the registries is known as drop catching. It is a highly competitive business. The main operators in this business typically set up a number of front companies as registrars. VeriSign, in the case of TLDs COM and NET, allows each registrar a slice of the resources that may be used to register dropped domains. VeriSign drops domains in a random order, giving registrars only a vague idea of the particular drop time of a particular domain. Sometimes a group of drop registrars often work in confederation to increase their possibility of registering a dropped domain immediately after it is deleted by the registry. If the domain is caught by a confederation of registrars attempting to fulfill a domain backorder, then whichever domain registrar caught the domain will register it to the entity who backordered the domain. If the newly reregistered domain is captured by a company that has no customers who backordered it, the domain may be auctioned to the highest bidder by the registrar who captured it or an auction intermediary. The time between a drop and a capture is often measured in seconds or fractions thereof. Some registrars do not allow domains to drop in the normal fashion, instead introducing an intermediary (example: Snapnames and Namejet) that auction the domain prior to their deletion. If nobody buys the domain at auction, it will pass through the normal deletion process. The latest statistics for domain name usage quoted in the Verisign Domain Brief for June 2009 states that of the 92 million COM and NET domain names, 24 % of these domains have one page websites, 64% have multipage websites and 12% have no associated websites. One thing interesting about domain name is that they normaly can only contain english alphabets. For example, you can't have domain name with chinese character in it. There's a try to fix it. Internationalized domain name. Allowing domain names in Unicode. IDN turns out rather stupid. This scheme does not modify DNS's Domain name to broaden it beyond alphanumerics, but relies on application that translate the host name to real ascii based one, a scheme called Internationalizing Domain Names in Applications (IDNA). The consequence of IDNA is complex implementation in browser (in part using Punycode), does not work if a host name in Chinese is long, increases Homograph spoofing attack, creates unpredicability in browser's URL field (because each browser opt different methods and display of URL to prevent the proofing attack). What it solves is to allow domain name in non-latin langs such as Chinese, Arabics, Russian to be used in host name. The latin alphabet in computing is rather popular and international and have been used throughout the history of the internet and widely used in every non-English speaking countries. Latin alphabet is simple too, and English is popular and considered a international language. The need for local lang in domain name is not that great, and the cost of introducing INDA's complexity outweight the benefits.